"He was a good man [comp. ib. 1, § 5], who admonished the Jews to practise abstinence [ἀρετὴν = "Pharisaic virtue" = "perishut"; comp. "B. J." ii. 8, § 2], lead a life of righteousness toward one another and of piety [εὐσέβειαν = "religious devotion"] toward God, and then join him in the rite of bathing [baptism]; for, said he, thus would baptism be acceptable to Him [God] if they would use it not simply for the putting away of certain sins [comp. II. Sam. xi. 4] or in the case of proselytes [see Soṭah 12b; comp. Gen. R. i. ], but for the sanctification of the body after the soul had beforehand been thoroughly purified by righteousness. The people flocked in crowds to him, being stirred by his addresses. King Herod Antipas, fearing lest the great influence John had over the people might be used by him to raise a rebellion, sent him to the fortress of Macherus as a prisoner, and had him put to death. "The people in their indignation over this atrocious act beheld in the destruction which came soon afterward upon the army of Herod a divine punishment." John the Baptist was made the subject of a legendary narrative embodied in Luke i. 5-25, 57-80, and iii. 1-20, according to which he was the son of Zacharias, a priest of the section of Abia, and of Elisabeth, also of priestly descent, and was born in their old age. The angel Gabriel announced John's birth to Zacharias while that priest stood at the altar offering incense, and told him that this child would be a Nazarite for life ("nezir 'olam"; Nazir i. 2); filled with the Holy Spirit from his mother's womb, he would be called upon to convert the children of Israel to God, and with the power of Elijah would turn the hearts of the fathers to the children while preparing the people for the Lord (Mal. iii. 24 [A. V. iv. 6]). 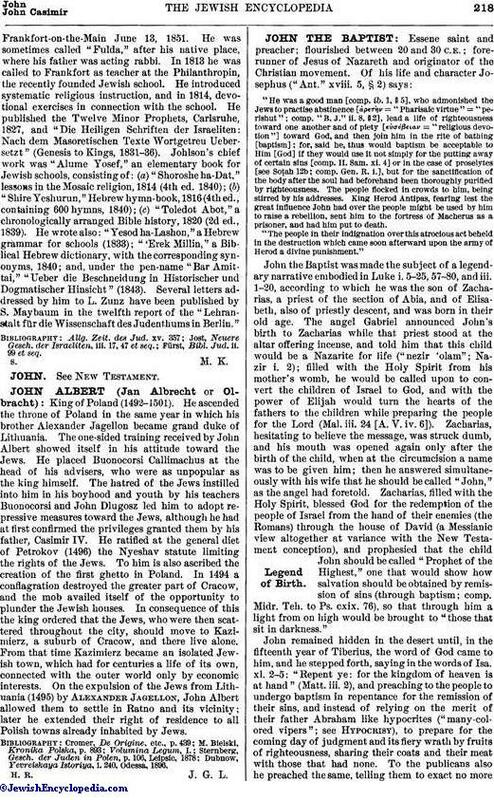 Zacharias, hesitating to believe the message, was struck dumb, and his mouth was opened again only after the birth of the child, when at the circumcision a name was to be given him; then he answered simultaneously with his wife that he should be called "John," as the angel had foretold. Zacharias, filled with the Holy Spirit, blessed God for the redemption of the people of Israel from the hand of their enemies (the Romans) through the house of David (a Messianic view altogether at variance with the New Testament conception), and prophesied that the child John should be called "Prophet of the Highest," one that would show how salvation should be obtained by remission of sins (through baptism; comp. Midr. Teh. to Ps. cxix. 76), so that through him a light from on high would be brought to "those that sit in darkness." John remained hidden in the desert until, in the fifteenth year of Tiberius, the word of God came to him, and he stepped forth, saying in the words of Isa. xl. 2-5: "Repent ye: for the kingdom of heaven is at hand" (Matt. iii. 2), and preaching to the people to undergo baptism in repentance for the remission of their sins, and instead of relying on the merit of their father Abraham like hypocrites ("many-colored vipers"; see Hypocrisy), to prepare for the coming day of judgment and its fiery wrath by fruits of righteousness, sharing their coats and their meat with those that had none. To the publicans also he preached the same, telling them to exact no moretaxes than those prescribed; to the soldiers he declared that they should avoid violence and calumny (as informers) and be content with their wages. (The sermon of John the Baptist given here is obviously original with him, and the similar one of Jesus, Matt. xii. 33-34, xxiii. 33, is based thereon.) When asked whether he was the Messiah, he answered that with his baptism of repentance he would only prepare the people for the time when the Messiah would come as judge to baptize them with fire, to winnow them and burn the chaff with fire unquenchable (the fire of Gehenna; comp. Sibyllines, iii. 286; Enoch, xlv. 3, lv. 4, lxi. 8)—a conception of the Messiah which is widely different from the one which saw the Messiah in Jesus. Among the many that came to the Jordan to undergo the rite of baptism in response to the call of John, was Jesus of Nazareth, and the influence wrought through him created a new epoch in those circles among which Christianity arose, so that henceforth the whole life-work of John the Baptist was given a new meaning—as if in his Messianic expectations he had Jesus in view as the true Messiah (see Matt. iii. 14; John i. 26-36). John the Baptist was regarded by the multitude as a great prophet (Matt. xiv. 5; Mark xi. 32). His powerful appeal (see Matt. xi. 12) and his whole appearance reminded the people forcibly of Elijah the prophet; "he wore raiment of camel's hair, and a leathern girdle about his loins; and his meat was locusts and wild honey" (Matt. iii. 4; comp. xi. 7-8). He stationed himself near some water-fountain to baptize the people, at Bethabara (John i. 28) or Ænon (John iii. 23). While he "preached good tidings unto the people" (Luke iii. 18), that is, announced to them that the redemption was at hand, he made his disciples prepare for it by fasting (Matt. ix. 14, xi. 18, and parallel passages). The prayer he taught his disciples was probably similar to the so-called Lord's Prayer (Luke xi. 1). John, however, provoked the wrath of King Herod because in his addresses he reproached the king for having married Herodias, his brother Philip's wife, and for all the evil things he had done. Herod therefore sent for him and put him in prison. It was while in prison that John heard of the work of preaching or healing done by Jesus (Matt. xi. 2-19; Luke vii. 18-35). Herod was afraid of the multitude and would not put John to death; but Herodias, says the legend (Matt. xiv. 6; Mark vi. 19 et seq. ), had plotted revenge, and when on Herod's birthday a feast was given at which Herodias' daughter ingratiated herself into his favor by her dancing, she, at the instigation of her mother, asked that the head of John the Baptist be given her on a charger, and the cruel petition was granted. John's disciples came and buried his body. The influence and power of John continued after his death, and his fame was not obscured by that of Jesus, who was taken by Herod to be John risen from the dead (Matt. xiv. 1-2 and parallel passages). His teaching of righteousness (Matt. xxi. 32) and his baptism (Luke vii. 29) created a movement which by no means ended with the appearance of Jesus. There were many who, like Apollos of Alexandria in Ephesus, preached only the baptism of John, and their little band gradually merged into Christianity (Acts xviii. 25, xix. 1-7). Some of the disciples of John placed their master above Jesus. John had thirty apostles, of whom Simon Magus claimed to be the chief (Clementine, Recognitions, i. 60, ii. 8; ib. Homilies, ii. 23). 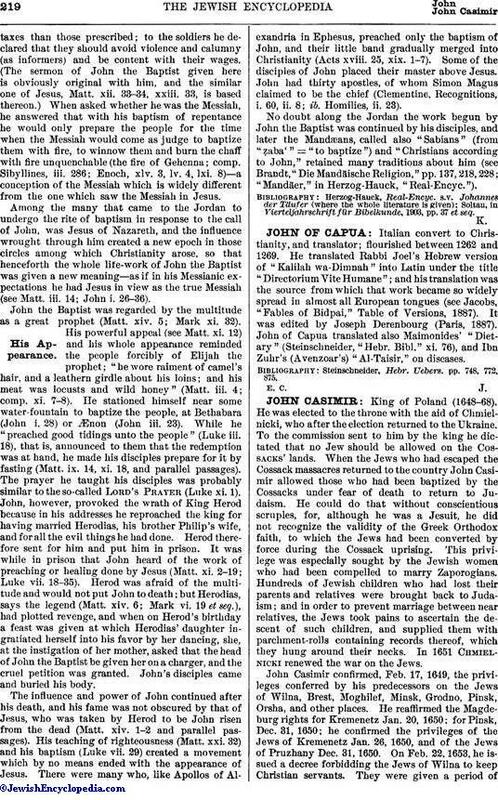 No doubt along the Jordan the work begun by John the Baptist was continued by his disciples, and later the Mandæans, called also "Sabians" (from "ẓaba'" = "to baptize") and "Christians according to John," retained many traditions about him (see Brandt, "Die Mandäische Religion," pp. 137, 218, 228; "Mandäer," in Herzog-Hauck, "Real-Encyc."). Soltau, in Vierteljahrschrift für Bibelkunde, 1903, pp. 37 et seq.